A small tear shaped Island, Sri Lanka has a rich history that is reflected in its cultural and architectural heritage. Apart from its splendid beach resorts, the architectural ruins in the inner highlands are an indication to the culture of ancient civilizations which is still very much relevant in the lifestyle of the Sinhalese. A hot and bustling city which few locals or tourists seem to love - far better to escape beyond it as soon as possible - but it's likely that you will end up spending a day/night there either end of your trip. Do some shopping; Barefoot (704 Galle Road) has great sarongs and furnishing fabrics and Paradise Road (213 Dharmapala Mawatha Street) sells antiques, homeware and good quality crafts. Have lunch at the cool Paradise Road Gallery Café, the former offices of Sri Lanka's best known architect, Geoffrey Bawa (at 2 Alfred House Road). At the end of the day take in a cool beer at the Galle Face Hotel - a colonial institution - while watching the sun set over the Indian Ocean. We highly recommend that you stay at the intimate Havelock Place Bungalows, a former homestead turned gallery/boutique hotel; or at the supremely classy and elegant Park Street Hotel if your budget can stretch. For tranquility not far from the airport, Horathapola is perfect, while the friendly Mount Lodge offers laidback hospitality in the beachside Mount Lavina area. If you're looking for a wild adventure you can stay at the eco-friendly Tree Tops Farm set amid a 100 acre forest near to Butalla and bordering Yala. Here safaris are on foot and you can sleep in a tree house. Sited on the edge of Yala West is one of the holiest places in Sri Lanka but not often visited by tourists. It is primarily a Hindu place of worship. The biggest festival is the Perahera at the time of the July or August full moon. If you don't have your own transport, buses run to Nuwara Eliya, Galle and Colombo. Not far from Kataragama is Galapita Ecolodge a wonderful jungle retreat where you can totally immerse yourself in nature and forget the rest of the world. Elephants, deer and birds abound and rivers provide cooling dips. Very much off-the-beaten track, it's well worth the effort of getting there. On the East coast, Arugum Bay has a beautiful bay and great surfing. The village has that sleepy feel of a place that time forgot - electricity only arrived here in 1995 and telephones in 1997. Stay at Kudakalliya, a simple beach hut right on the edge of the jungle. From here, explore the jungle where herds of elephant roam wild, and discover some fascinating and rarely seen archeological sites including the ancient palaces of Muhudu Maha Vihare and Magul Maha Vihare, and the buddhist hermitage at Tharulengala with its large rock cave for meditation (similar to that at Dumbulla), all more than 2000 years old. Sri Lanka's best known fishing village, however, now rather faded and dirty. Brief (10 km inland from Bentota), the house and gardens of Bevis Bawa, a socialite and brother of famous architect, Geoffrey, who died a few years ago. It's worth visiting for the lovely gardens and interesting artefacts. The Turtle Hatchery 8km south of Bentota at Kosgoda is said to be the best place to see giant turtles and their babies and is endowed by Hasselblad cameras. Sri Lanka' original hippy hangout. Now rather crowded and overbuilt, it caters for both package groups and backpackers. However, Hikkaduwa is considered one of best places on this coastal stretch for surfing, diving and snorkelling. There are plenty of colourful fish, though much of the coral is dead (unfortunately, there are large numbers of glass bottom boats motoring around polluting the waters). The surf is ideal for beginners: the water is very warm (no need for a wet suit) and the breaks user-friendly (though mainly offshore on coral reef). For the best waves, go early morning (November-March). Board hire and lessons available at the A-Frame surf shop. Around the southernmost tip of Sri Lanka you'll find miles of quiet beaches, small fishing villages, and the historic Galle Fort. A few km south of Galle is another backpackers destination, more low key than Hikkaduwa although becoming increasingly popular, though it was hit badly by the tsunami and building work abounds. Its narrow sandy curve is backed by palms and its one of the few places where swimming is safe. You can also go snorkelling and diving (November-March). A number of divers have recommended the Unawatuna Diving Centre run by Sumith, Shelton and Michael Busch (tel: +94 9- 44693, mobile: +94 77 903430) who offer a range of dive courses in German and English. Reasonably-priced open water, wreck and night dives are offered, starting at about US$35. If you are used to visiting the world's top dive spots, you might be disappointed. The Secret Garden is a good budget option here here. Walk or drive round the coast from here and you can find some beautiful quiet beaches, with fewer touts. Unawatuna has plenty of cheap restaurants (great seafood) and bars. At Thalpe you can stay right on the beach at the beautiful Apa Villas with its ultra-stylish pool, or Illuketia, situtated slightly inland and hidden away in lush greenery alive with tropical birds. See rice paddies and coconut gatherers without having to travel miles inland and catch a 3-wheeler for the 10 minute journey to Unawatuna. The Kataluwa Buddhist temple, hidden in the jungle and has some of the most interesting frescoes in Sri Lanka - and you don't have to share it will busloads of tourists as in the Cultural Triangle. Between Unawatuna and Weligama, you can see the famous stilt fishermen at work, perched on stakes in the water fishing with a rod and line. The best place to see them is Ahangama. A small busy town with a large sandy bay. The beach is close to the main road and not so clean near the town centre. Just off shore is the extraordinary Taprobane Island, once home to an eccentric French count and later, the writer Paul Bowles. You can live out your island fantasy by renting this stunning house in its entirety (sleeps 8, fully staffed). 4km from Weligama and in the same bay, it's a laid back little place and one of Sri Lanka's most attractive beaches with a sandy crescent and calm clear water that's good for swimming. A fishing port just round the island's southern tip which also has a few good beaches and reef diving. On the edge of Tangalle is the arty and glamorous Beach House, a fully-staffed villa (sleeping 6) for rent with its own stretch of palm fringed white sand. Chanika's, a small restaurant in Tangalle on the Mahawela Rd going towards Matara, serves great seafood. 11km west of Tangalle is Claughton Villa, designed by Sri Lanka's renowned architect Geoffrey Bawa, and available to rent (sleeps 6, with full staff and food included). Also close to Tangalle, the newly renovated Last House, another Bawa villa, sleeps up to 12 people. There's no train to Tangalle, the line terminates at Matara about 1 hour away by bus. Nearby is Wewrukannala Temple, just inland from Dickwella, with its 50 metre high Buddha, built in the 19th century and the largest in Sri Lanka. The dry, flat area north east of the Hill Country, bounded by Kandy, Anuradhapura and Polonnaruwa, is known as the Cultural Triangle. The region covers Sri Lanka's most famous cultural and archaeological sites - some dating back 2,500 and containing the remains of the Sinhalese civilisation which grew through the centuries under the influence of Buddhism. At the heart of this triangle is Dambulla, perhaps the best base for exploring the sites. A little further west, and perfect for yoga/meditation lovers and anyone wanting a true retreat, is Ulpotha. To the south, Kandy is also a possible starting point for exploring this region, with lots of places to stay: see our guide to the Hill Country. 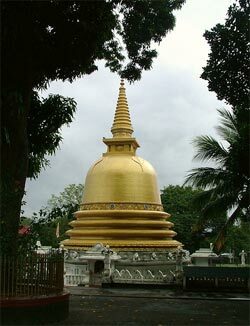 Of the better known sites the nearest to Kandy is the rock temple of Dambulla on the way to Anuradhapura. The caves' history dates back to 1st century BC when King Balagam Bahu, took refuge here and later turned the caves into a magnificent rock temple. It's now a World Heritage site. The five caves, richly painted with Buddhist murals, are sited on a huge granite outcrop towering 150m above the surrounding jungle. Photography is strictly prohibited inside the temples. The climb up is best done in the early morning. Be warned it is not the most pleasant ascent - it's steep, littered and gets crowded with touts and beggars. On the way to Dambulla, 2km north of Matale, its worth stopping off at the Heritage Centre run by Ena de Silva which houses some of Sri Lanka's best handicrafts and has a restaurant serving good traditional food. This awesome rock fortress, is a World Heritage site and one of Sri Lanka's major attractions. Atop a massive 200m rock outcrop, overlooking dense jungle and a vast plain, are the remains of a 5th century cliff-top palace and water gardens that once covered 5 acres. According to legend, it was the stronghold of King Kasyapa who killed his father and found refuge here for 18 years. Among the ruins are frescoes of 'heavenly maidens' painted half way up the rock and a two enormous stone lion's paws. It's well worth the steep climb - the views are stunning from the top. Again, it's best to get there early in the morning to avoid the crowds and midday heat. Tickets cost about $15. Dambulla and Sigiriya can be reached on the same day from Kandy. 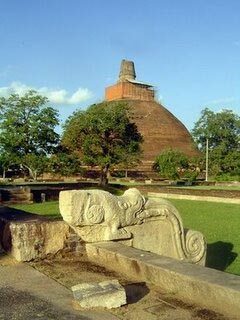 One of Sri Lanka's most important archaeological sites and the first capital of the Sinhalese kings (lasting over 1300 years from 3th century BC to 10th century AD). It contains large artificial lakes, temples, frescoes and dagobas (solid hemispheric mounds) and the sacred Bo-Tree believed to have grown 2,300 years ago from the tree under which Buddha became enlightened. Anuradhapura can be seen as a day trip from Kandy (buses take about 3 hrs), but if you're short of time, this is probably the one to miss out. An ancient and compact city, Polunnaruwa was the second seat of rule and a medieval capital 11-12th century. Features include 12th century stone sculptures, an old irrigation system with huge tanks/lakes and three huge Buddha figures, the Gal Vihara, considered to be amongst the most sacred monuments in Sri Lanka. There are also palace ruins and friezes. Allow at least 2 hours to see the sites. If you have limited time, it's probably easier to see this city rather than Anuradhapura which is more spread out. The geographical, cultural and religious heart of Sri Lanka and the last stronghold of the Sinhalese kings, falling to the British in 1815. Kandy is a laidback town built around a peaceful lake and surrounded by lush green hills. It makes an excellent base for exploring both the Hill Country to the south and the ancient cities to the north. But unless you're there during a festival, don't expect buzzing nightlife. Stay at Helga's Folly, an extraordinary small hotel with wild murals painted throughout, or at the more peaceful Villa Rosa or Stonehouse Lodge a little further up the hill. The Dalada Maligawa or Temple of the Tooth, a temple which houses Sri Lanka's most important religious relic - the sacred tooth of Buddha. As such, it has a constant flow of both tourists and pilgrims. In July/August the town hosts Sri Lanka's most important festival (and one of the most famous in Asia), the Kandy Esala Perahera, a 10 day event, culminating at the time of the full moon in a spectacular procession with thousands of dancers, drummers and decorated elephants (one of which carries a replica of the tooth relic shrine). Fancy something arty? Check out the Bombyx Mori Craft House, which offers interesting 1-5 day courses teaching a range of crafts from raku pottery to making your own paints and dyes. There are a number of lovely scenic walks around Kandy. There's also the 60-hectare Peradeniya Botanic Gardens, a few km outside the town which are becoming slightly neglected but have an interesting orchid house, flower gardens a royal avenue of palm trees - nice to hire a bicycle and take a picnic. Pinnewala Elephant Orphanage, a government-sponsored refuge which cares for over 60 abandoned and orphaned wild elephants is 38 km away on the way to Colombo. It's a must for elephant lovers. Get there for feeding/bathing times. Day trips can be made to explore the Buddhist temples, rock sculptures and ancient cities of the Cultural Triangle to the north - most are within about 2.5/3 hrs drive of Kandy. Sri Lanka's highest town (nearly 2000m) was once the favourite hill station of the British and still retains some distinctive colonial features. Although featured on the itinerary of every tour of the hill country, it has rather lost its charm and is a favourite haunt of touts. Far better to make your base one of the beautiful tea estates nearby such as the Tea Factory Hotel - a converted tea factory that makes an unusual and comfortable stay. To get to Nuwara Eliya from Kandy either drive (3hrs) or take the scenic train journey (3.5 hrs) - the nearest station to N' Eliya is Nanu Oya, 9km away from where you can get a taxi or bus. If you want to look around a working tea estate, a good one is Labookellie which is about 15km before Nuwara Eliya approaching from Kandy. For a taste of the past have a drink or a game of billiards at the old colonial Hill Club or Grand Hotel. Another remnant of the British era is a golf course - the best in Sri Lanka. In need of rejuvenating check out the authentic ayurvedic treatment room at the Tree of Life. This is good hiking territory and there are countless walks. The most well known is the walk up Adam's Peak (Sri Pada) which for over 1000 years has been a place of pilgrimage. At its summit (2224m) is a huge 'footprint' which according to Muslim legend is the place where Adam first set foot on earth. Buddhists believe it be the mark of Bhudda, Hindus ascribe it to Lord Shiva and Christians to St Thomas and Muslims to Adam. During the pilgrimage season (Dec-Apr) a large number of visitors make the ascent. It's about a 3-4 hour climb (7km) from the town of Dalhousie and is usually done at night. The steep path, which is mainly up steps, is lit in season and there are plenty of teahouses on the way. The view from the peak at dawn is spectacular (note: if you go out of season the peak is usually obscured by cloud). Make sure you take warm clothing as it gets very cold. Don't expect a peaceful experience - it can get very crowded particularly at weekends and poyas (full moon), loud speakers emit anything from Buddhist chants to contemporary music and there's a rather unpleasant trail of litter. Despite this, it's still the highlight of many a visit to Sri Lanka. If you don't have your own car, buses run in season to Dalhousie from Kandy, Nuwara Eliya and Colombo. Alternatively, you can take the train as far as Hatton, followed by a 2hr bus to Dalhousie. The region has great potential for mountain biking - but best to bring your own wheels. Situated at 1,400m, this small market town is perched right at the southern edge of the hill country with a breathtaking view of the south of the island. Haputale makes a good base for visiting tea plantations and walking in the cool mountain air. All the trains on the Colombo-Kandy-Badulla route stop at Haputale - it's about 2hrs from Nanu Oya (Nuwara Eliya). Horton Plains, Sri Lanka's highest and most isolated grass covered plain (similar to an English heath) is another spot for walkers. Paths lead you to the precipice known as World's End where there's a sheer drop of 700 m. To avoid wandering around in the mist, go in Jan-April and get there before 10.00am. You can go by train, but the nearest station is Ohiya (40 mins from Haputale) from where it's an 8km uphill walk to the entrance. World's End is a 40 min walk from here. Instead we would recommend hiring a car with a driver so you can get up their early without having to set off in the middle of the night. The entrance is about 25km away from Nuwara Eliya (about 1.5 hrs drive). Ella Gap on the edge of the Hill Country is one of the best views in Sri Lanka - on a clear day you can see all the way to the south coast. To best appreciate the scenery, stop for tea in the garden at the village resthouse. All trains on the Colombo-Kandy-Badulla line stop at Ella (it's a beautiful 1hr journey from Haputale). Ella also makes a great base for walkers and is drier than more western areas of the Hill Country. 's most spectacular. It's 6km from Badulla (the end of the railway line - 2 hrs from Haputale/1hr from Ella) followed by a 20 minute walk. Less magnificent but worth a visit if enroute are the Diyaluma Falls, 170m high and one of Sri Lanka's highest. If you are heading down to Wellaya from Haputale it's about half way down (1 1/4 hrs) and 5km past Koslanda. Situated at 1230m, this is a busy market town which has little to offer the traveller other than it's the base for Woodlands Network, run by a group of local volunteers, promoting community tourism. They run a basic hostel, but their real strength is providing an excellent source of information on walks and things to see and do in the Hill Country. They can also arrange homestays on tea plantations and safaris such as Tree Tops Farm. Situated on the south western edge of the Hill Country Ratnapura is Sri Lanka's gem centre - sapphires, amethysts, aquamarines and moonstones are just some of the many gems mined. You can visit the mines, but it's the most expensive place in the country to buy gems. This is not somewhere to come and relax - it's buzzing with touts and is one of Sri Lanka's wettest towns. The 3hr drive here from Haputale, along the southern edge of the Hill Country, is beautiful. Sri Lanka's last major area (8800 hectares) of virgin rainforest that was designated a World Heritage Site in 1989. There's an abundance of birdlife, tropical foliage, small mammals, monkeys and leopard (rarely seen).